Maureen originally added her story to the Memories Book. I have moved it here so that I can add a photograph and some comments of my own. I was born in Plymouth in 1939 and moved to Bath in Feb 1942. Yes, that's right, out of one blitz and into another! We lived in Stuart Place, East Twerton, right next to Oldfield Park railway station. I remember being held in my Father's arms and he was angry with my brother Brian, who after getting out of bed, went round to the other side and got back in again. Just as Dad pulled him from the bed the window was blown in over it. Victoria Road, East Twerton School, and houses in Dorset Street were badly bombed. We were very lucky, we only had a damaged chimney. Our air-raid shelters were in the middle of the road, next door to the railway embankment. By-the-way, I was 2yrs and seven months old. My main memories are of the trains in Oldfield Park waiting for the all clear to go into Bath. Mind you, we had some great parties to celebrate the end of the war in Europe and Far East. 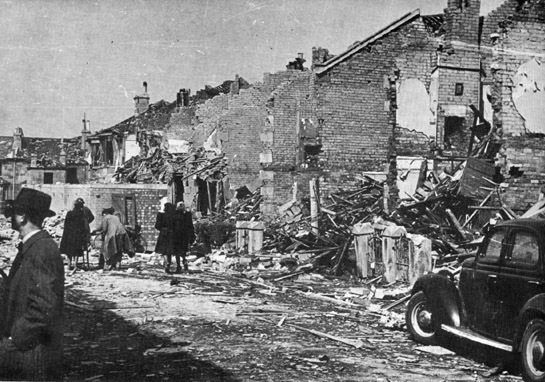 This picture shows Victoria Road, which Maureen described as "badly bombed", with Victoria Terrace in the distance across the end. Dorset Street, and Stuart Place where Maureen was living, is behind Victoria Terrace. Notice the brick and concrete air raid shelters in front of the houses in Victoria Road. (A clearer view of these shelters in in the Bath Preparations section). In spite of all the damage to the houses, nobody in these air raid shelters was injured. The shelter that Maureen referred to as "in the middle of the road" would have looked like these.